For 50 Junior Engineer, Technician Grade III, Patwari Clerk Posts, Northern Railway Recruitment 2019 Notification is released. Interested candidates across the country, after checking the complete details, can proceed to apply, for the available positions before the final date. By 12th February 2019, interested candidates, have to submit the application form. Applications are asked to submit in an offline Manner. We shared the address at the end of this post. Keep on checking our site Freshersnow.com for more Central Government Job Notifications. Here is the chance for all the people, who are looking for the Central Government Jobs. All you have to do is check out the total information. And then proceed to submit the application form before the final date. 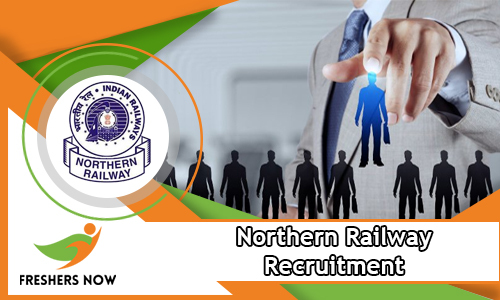 All the details about the Northern Railway Recruitment 2019 are shared in the coming sections of this post. So, without skipping, try to check them all. Apparently, the officials of the Northern Railway are looking for the Candidates who are retired government employees. For more information check the Advertisement. Applicants age should not exceed 64 Years. For clear details check the advertisement. Apart from Medical Fitness Test, there are no other rounds, that an individual need to clear. And read the information correctly. Hope the total details we are including in this article, related to the Northern Railway Recruitment 2019 Notification is informative. Apply Online For 1092 ACT Apprentice Vacancies, after checking for the information in the Northern Railway Recruitment 2019 Notification. Now, the officials are looking for the Candidates who completed their 12th along with ITI and Diploma from any Recognized institute or university in India as the educational qualification. Having the correct qualification exactly is very important. Then only the applications will be accepted by the officials of the Northern Railway Recruitment 2019. According to the information in the Advertisement, an individual has to submit their filled application form by 31st January 2019. After that, no application will be considered. If you are looking for the Central Government Jobs, that too in the Railways, then the candidates have to check about the Latest Northern Railway Recruitment 2019 Notification. Apparently, the officials of the Northern Railway are going to conduct some selection rounds, through which they want to select the correct candidates for the available ACT Apprentice Positions. Now, if you are not interested in this Recruitment or if you are not eligible to apply for the Northern Railway ACT Apprentice Recruitment 2019, candidates can check more other Latest Government Jobs on our site Freshers Now. Computer Operator & Programming Asstt. 06 Computer Operator & Programming Asstt. Computer Operator & Programming Asstt. 01 Computer Operator & Programming Asstt. As per the details in the notification, contenders need to complete their Plus two, ITI, Diploma from any recognized institute or University. Over there you will find the ACT Apprentice Recruitment Advertisement. We shared total information about the Northern Railway Recruitment 2019 Notification, after checking them all, continue to apply. Apply Online For 21 Sports Quota Posts after checking the requirements given in the Officials Northern Railway Recruitment 2019 Notification. We also shared the total information in this article, too. According to the details in the advertisement, aspirants have to submit their filled application form by 18th January 2019. After that, no applications will be accepted by the officials of the Northern Railway. Well, the job location for the selected candidates will be across the country. Remember the officials are looking for the Candidates, who complete their Graduation or Matriculation from any Recognized institute or University. For more other Job opportunities, go ahead and check on our site Freshersnow.com. If you are willing to settle, with a Railway Jobs, then this chance is for you all. Go on and check all the details. And then go ahead to apply, for the Northern Railway Sports Quota Recruitment 2019, by submitting the application form before the final date. Remember, that as of time applying, all the contenders, need to have the qualifications, if not all such application will be rejected along with those submitted after the final date. Well, the candidates, have to check the table. It got all the details, that an individual need to know. Aspirants have to complete their 10th or Graduation from any recognized institute or University in India as the Educational Qualification. 18 years to 25 years is the Age Limit, that an individual need to have while applying. Rs.5,200 to Rs.20,200/- Per month is the salary, officials of Northern Railway are offering. Check the official site of Northern Railway at nr.indianrailways.gov.in. And then there you will find the Notification for the Sports Quota. Northern Railway Recruitment 2019 Notification is a good opportunity for all those people, who are looking for the Government Jobs. Northern Railway Recruitment 2018-2019 Notification is released recently. Therefore, all those people who are looking for the railway Jobs should notice this opportunity. Now, the Northern Railway Officials clearly mentioned each and every information in the Notification. And we are going to break down and elaborate them all. Now, all you have to do is check the information. And then proceed to apply for the Northern Railway Recruitment 2018-2019 before the Final date. So, already the officials of the Northern Railway are accepting the applications from the eligible people. Now, the contenders have to submit their application form by the final date. And the closing date for that is 14th May 2018. Remember that your applications for the Northern Railway Recruitment 2018-2019 after the closing date are invalid. So, keep that in mind and proceed to apply. Also, at the time of applying you need to have all the qualifications. There are total 409 Vacancies. And these openings are for the Station Masters, Station Superintendent, Pointsman, Shunting Master, Train Clerks Positions. So, all the people who are interested in these positions are requested to go ahead and check the requirements to apply for the Northern Railway Recruitment 2018-2019 Notification. Now, are you seriously looking for the Government Jobs in India? yet no luck in finding the appropriate chance. Then this Northern Railway Recruitment 2018-2019 Notification might come handy for all such people. So, please go ahead and check the information beforehand, rather than getting disappointment after applying. So to help the people here we are creating this new article. And this contains the complete information that is mentioned in the official advertisement. All the people who are thinking to apply for the Northern Railway Recruitment 2018-2019 should first notice the correct qualification. For the sake of the candidates here we placed a table. And it contains all information regarding the Northern Railway Recruitment 2018-2019 Notification. So, check them at first then proceed to apply for the Available vacancies before the closing date. In the above table, we have tried to include all the mandatory information. As per the information in the advertisement, all the people can find the data about the Name of the organization, Name of the Vacant position, Number of Vacancies available, Mode of the application form, Starting date to apply, Closing date to submit the application form. Along with all these, we also mentioned the official site of the organization. More other details about the Northern Railway Recruitment 2018-2019 are given in the next parts of this article. So, please proceed and check them to get an overall idea. Now, the officials of the Northern Railway are very particular such that they are looking for the candidates who are having all the qualification correctly. And this includes both Work Experience and Educational Qualification. Well, the officials of the Northern Railway didn’t mention anything about the Educational Qualification, but they did mention other requirements. So, apparently, the applicants can be Retired Railway Employees who previously worked as the Station Master Cadre, Shunting Master, and Pointsman. Other than this, there are no other qualifications that are specifically, mentioned in the official Northern Railway Advertisement 2018-2019. Along with the Qualification, applicants should also need to have the correct age. Even the officials mentioned about it in the advertisement too. Check further for more other data too. So, by observing the official Northern Railway Recruitment 2018-2019, we can tell you that the officials are looking for the applicants with a certain age. Now, as per the data in the advertisement, the candidate’s maximum age can be 62 years. Also, there is even some Age Relaxation available. And it would be appropriate for the people, to check the Northern Railway Recruitment 2018-2019 Notification, to find out about the age. Also, next important factor all the people should know if they want to apply for the Northern Railway Recruitment 2018-2019 is the Application fee. Well, there is no mention of the application fee in the advertisement. But we suggest all the people, to check the Northern Railway Recruitment 2018-2019 Notification which we have attached at the bottom of this article, before making any kind of payment. As there are many sites out there providing misleading information for the aspirants. Now, after checking them all, still, if you are eligible and interested, you can apply for this Northern Railway Vacancy 2018-2019. Now, next important thing all the applicants have to know is the Recruitment Rounds. Well, the officials of the northern railway have planned to conduct the Selection Rounds in order to hire the best applicants. So, all the people who will submit their application form before the closing date have to participate in those rounds. So, keep that in mind. And then proceed further to prepare yourself. Well, as per the data are given in the Northern Railway Recruitment 2018-2019 Notification, all the contenders have to attend the Personal interview on the specified date. So, only keeping the performance of the applicants in mind. The officials of the northern Railway are going to select the people for the available vacancies. Other than that there is no mention of other Recruitment Rounds. Now, those people who got selected with get the salary that the Northern Railway Officials are offering. Accordingly, the people are going to get Rs.5,200 to Rs.34,800/- per Month. And these will change from position to position. To find out about the Post-Wise Salary information, you can always check the official advertisement or this article. Also, please proceed and check other information from the next sections. Down in this post, we also attached the RRC NR Job Openings 2018 Notification too. Retired Railway Employees who had experience as Station Master Cadre, Shunting Master, and Pointsman. Initially, go to the official site of the Northern Railway at www.nr.indianrailways.gov.in. Like the information provided on this page about Northern Railway Recruitment 2018-2019 Notification for 409 Pointsman, Station Masters and other Vacancies. Get more such notifications by following Freshersnow.com closely.